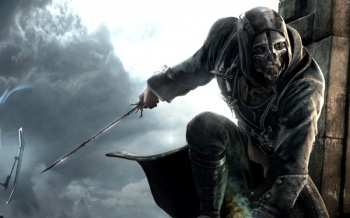 A Twitch test for Bethesda's E3 presentation may have spilled the beans on a Dishonored sequel. Bethesda's Twitch channel has been offline in preparation of this year's E3, but earlier today it "accidentally" went live for a few minutes (with audio only), during which YouTuber Matty Schroeder heard the studio talking about its E3 plans. While we already know the studio will be showing us more Doom and Fallout, what we hadn't heard anything about was a follow-up to the critically acclaimed Dishonored. Well, Matt claims to have heard Bethesda talking about a Dishonored sequel, with a presentation by Harvey Smith, co-director of the first game, happening at some point during the studio's conference. You can check out the audio from the Twitch malfunction yourself here. It is entirely possible that what we are hearing is the participants practicing for the conference, and saying "we are honored". Meanwhile, Bethesda has taken the mix up in stride, announcing that the "Twitch test a success. Tune in tomorrow night at 6:45 pm PT for more surprises," via its official Twitter account.